Dinner made in one pan and under 30 minutes? Yes please! 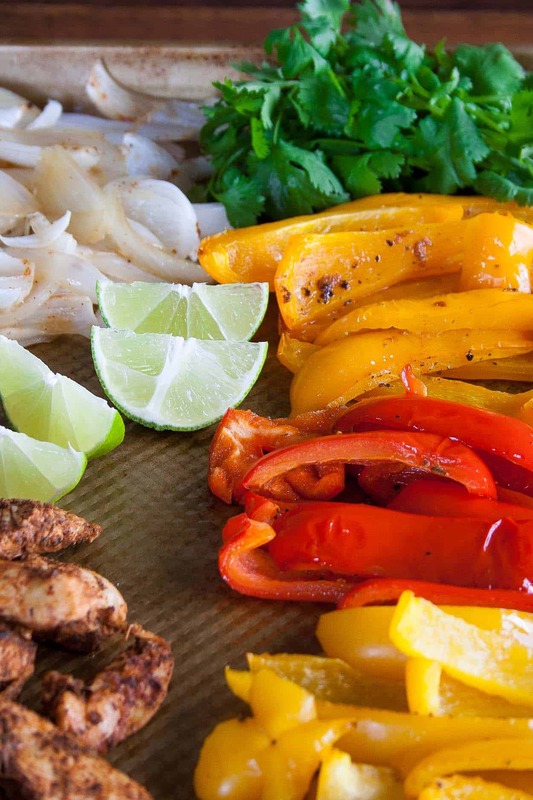 Sheet pan chicken fajitas are an easy paleo and whole30 dinner the whole family will love! As I am writing this post, I am eating leftovers of these sheet pan chicken fajitas and I AM IN LOVE. You know when you order fajitas at a Mexican restaurant, and as they come out of the kitchen sizzling, the entire restaurant turns towards your server and stares longingly at your dinner, wishing those fajitas were theirs? But they are yours! Best feeling in the world. Another great feeling is when you make sheet pan chicken fajitas at home and none of that oil platter is on your stove top because the entire recipe is made on one sheet in the oven. Now THAT is a good feeling. I have a tendency to crave chicken fajitas right after our kitchen has been cleaned and it drives Pat absolutely mad. Because, you see, the best part about traditional chicken fajitas in a cast iron is cooking with olive oil and a super hot pan so the peppers get nice and charred. So, I set out to make chicken fajitas in the oven and it might just be my new favorite weeknight dinner! Let’s make sheet pan chicken fajitas! Marinate the chicken with lots of spices and lime juice – overnight if possible but definitely for 30 minutes. It will make a difference! Toss sliced bell peppers and onion with olive oil, salt and pepper. Bake for 7 minutes. Add the chicken on top of the onions and peppers. Bake for an additional 15-20 minutes. EAT with copious amounts of avocado, cilantro, and more lime juice. How easy is that?! Plus there are no oil splatters to clean up and you only have to wash one pan. AND you just treated yourself to a healthy and satisfying paleo and Whole30 approved meal! Looking for another sheet pan dinner? Check out my Sun Dried Tomato Crusted Chicken & Green Bean Sheet Pan Dinner! When you make these Sheet Pan Chicken Fajitas post a picture on social media and use the hashtag #imhungrybynature for a chance to be featured! Slice chicken into strips and place in a plastic bag. Add remaining marinade ingredients and place in the fridge for 30 minutes at least, preferably overnight. 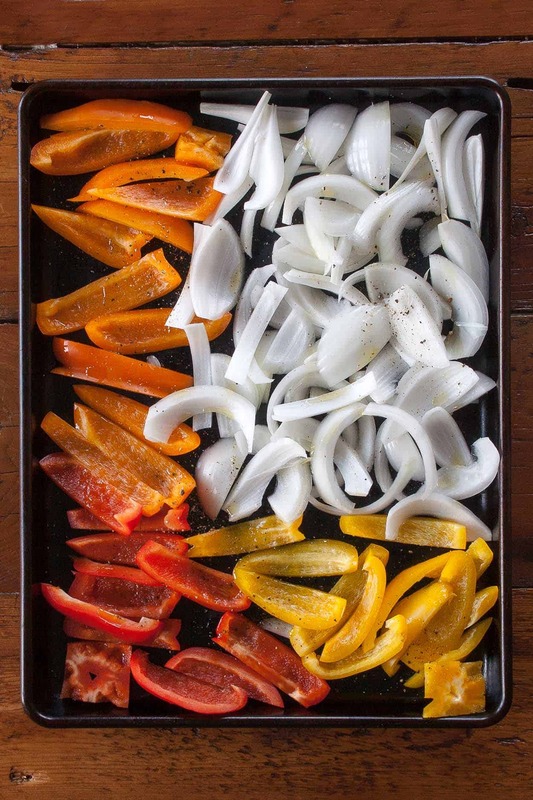 Slice peppers and onions into strips and place on a baking sheet. Toss with olive oil, salt, and pepper. Bake for 7 minutes. 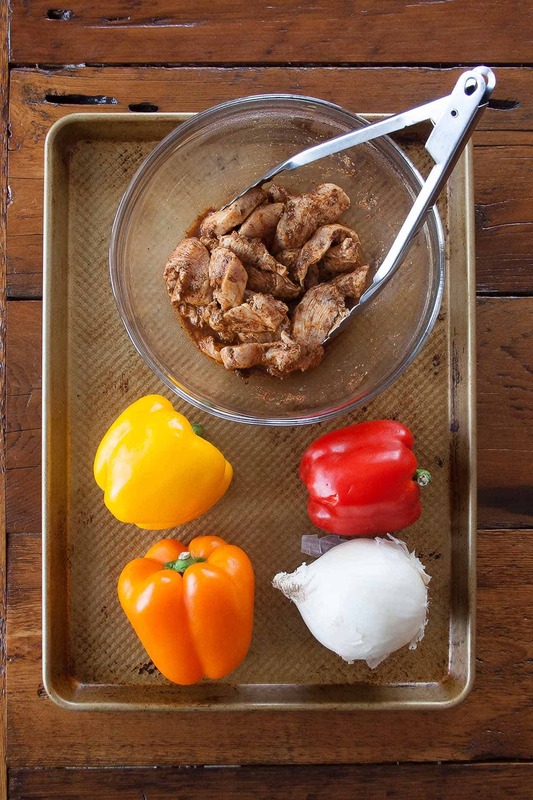 Add marinated chicken to baking sheet with peppers and onions. Bake for 15-20 minutes or until the internal temperature is 165 degrees F.
Serve with tortillas, avocado, lime, and cilantro. THESE are on the menu for the upcoming week. Holy yum. We always make grilled steak fajitas (which are fab), but this looks like an awesome way to mix things up! No joke, I make sheet pan fajitas for me and the hubbers twice a week. I can’t wait to try your seasoning combo! It sounds absolutely delicious! I believe it! They are so quick and easy and downright delicious. Let me know what you think of the spice blend!